Where Conservative activists are concerned, then the ascending order of priorities is Scotland (of which many of them actively want rid), Northern Ireland, Gibraltar, and the Falkland Islands. They have, by the way, no idea that there are British Overseas Territories other than Gibraltar and the Falkland Islands, just as they have no idea that there are Commonwealth Realms other than Canada, Australia and New Zealand. But to British politicians of any seniority in any party this side of a Corbyn Government, then anywhere and anyone can, in principle, be thrown under the bus. Scotland or Northern Ireland, Gibraltar or the Falkland Islands, anywhere or anyone. Nothing on Radio Four this morning about Ray Mawby, one of only two Ministers ever to have been a Soviet Bloc agent. The other, John Stonehouse, was as right-wing as it was possible for a Labour MP to be until Tony Blair removed the right flank altogether. Nor was there anything on the fact that it has not been "Moscow gold", but the American greenback, that has corrupted and coloured British politics in general and the Labour Party in particular. Even if attention must be confined to the fairly distant past, then a programme on the activities of Michael Stewart or Sam Watson might be very well worth listening to. "Labour Want To Dismantle Our Armed Forces"? The Conservatives here sound like very old school trade unionists who do not like competition. Dismantling the Armed Forces is their job. And it must be said that they are bloody good at it. On 14th March, I was wrongfully arrested in an attempt to intimidate me out of contesting these elections. But I have not been intimidated. On 4th May, I ask for your vote for Durham County Council in the Lanchester Ward (Lanchester, Burnhope and Castleside), and for Lanchester Parish Council. 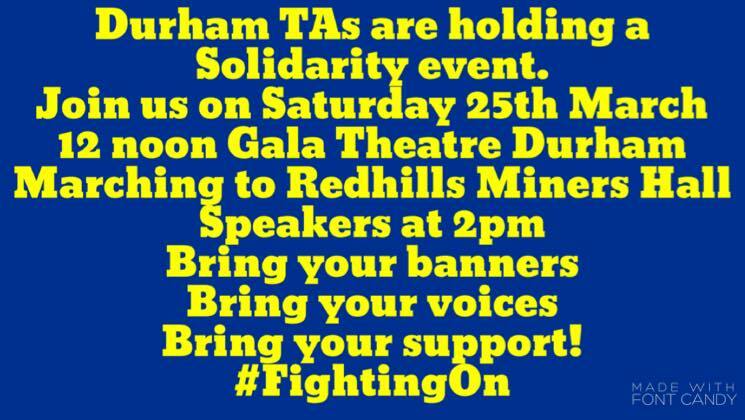 I have been brought back into active politics as a campaigner for justice for Durham County Council’s Teaching Assistants, as a campaigner against the proposed drastic cuts to hospital services in County Durham, and as a campaigner against the cuts to the public transport on which, as a disabled person, I am reliant. I was a member of Lanchester Parish Council from 1999 until I stood down voluntarily in 2013. I was a governor of Lanchester Endowed Parochial Primary School from 1999 to 2007. I was a governor of St Bede’s from 2000 to 2008. I have lived in Lanchester since the age of 13, and before that I lived from the age of four in Burnhope. I have supported the Teaching Assistants from the start. Among other things, I secured the endorsement of their cause by several national trade union leaders in the Northern Echo on 3rd August 2016. I secured their landmark meeting with Jeremy Corbyn on the eve of last year’s Miners’ Gala. I secured the signature of Angela Rayner on their petition. And I secured the support that George Galloway expresses for them regularly on his radio programme, and routinely to his quarter of a million followers on Twitter, as well as at least once (23rd November 2016) in a letter to the Northern Echo. I am a strong critic of Durham County Council’s incompetence. That includes the closure of the DLI Museum, the amassing of vast reserves while services have been and are being cut, the bailing out of Durham County Cricket Club despite those cuts, the mismanagement of relations with the Regional Assembly, the selling off of care homes at discounted value, the scandal of Windlestone Hall, the circumstances that necessitated the award of enormous compensation to a teacher, the substantial additional cost of the failure to pay that compensation promptly, the lavish expense of entertainment by senior Councillors and Officers, and the waste of five thousand pounds on a bus shelter that was not on a bus route. I regard the current Labour Leadership of Durham County Council as no better than in the 1960s. The Council has awarded irregular contracts, a Council Officer has received only a caution for gazumping on land fees, a decoy candidate has been fielded in an election (watch out for that one), Councillors have been let off for failing to pay Council Tax, Councillors have failed to declare interests, Councillors have promoted their own businesses, Freedom of Information Requests have been ignored, and Opposition candidates have been denied information. I am already working with trade unions, Conservatives, Liberal Democrats and Independents, to bring the whole of the Volkswagen Group’s production for the British market to County Durham after Brexit. That would include Volkswagen, Audi, SEAT and Škoda. What a contrast with a Labour Leadership that, for 32 years and counting, has merely managed other people’s poverty. I am honoured that my Campaign Patron is Councillor Alex Watson OBE of Consett North, who led Derwentside District Council for decades. I support the re-election of all sitting Independent, Liberal Democrat and Conservative County Councillors, and the election of whoever is best placed to defeat Labour in each Ward. Published and promoted by, and on behalf of, David Lindsay, 13 Foxhills Crescent, Lanchester, Durham, DH7 OPW. What is this thing, the Jewish Labour Movement, that is gunning for Ken Livingstone? With all of two thousand members, in a party of half a million, it recruits its staff directly from the Israeli Embassy. Imagine an organisation affiliated to the Labour Party, and which presumed to decide who could or could not be a member of that party, but which recruited its staff directly from the Russian Embassy, or the Syrian Embassy, or the Pakistani Embassy. If there must be these ethnic caucuses, then the Jewish supporters of Jeremy Corbyn ought to organise and affiliate their own. There are easily more than two thousand of them. Oh, and someone ought to make a television programme about Hitler's attempt to transport the Jews to Palestine, and his deal with the Zionist leadership to make it happen. It is a fascinating little tale. Over, perhaps, to Ken Livingstone? Is Theresa May being opposed from the left of her party? No, she is being opposed by Ken Clarke and Michael Heseltine. Those were leading members of the Government that privatised the railways, that first tried to privatise the Royal Mail, that imposed VAT on domestic fuel and power, that tried to double it the following year, and that closed the pits that had worked through the Strike, something that Margaret Thatcher had honoured her promise never to do. Clarke has been a Whip or a Minister under every Conservative Prime Minister since 1970, other than the one who came to office after he had already announced his intention to retire from the House of Commons. He was a Minister continuously from 1979 to 1997, implementing key aspects of Thatcherism at Health and Education. He was Chancellor of the Exchequer for most of John Major's Premiership, notably attempting to double the fuel tax. Had the Conservatives won the 1997 Election, then he would certainly have taken Britain into the euro, to which Gordon Brown had the foresight to be implacably opposed. Like the Liberal Democrats, he must take a share of the blame for every bad thing that the Coalition did at home and abroad. Yes, he voted against the Iraq War, and he delivered what now turns out to have been a painfully prescient speech against it. But that was his stopped clock moment. He is no hero. Heseltine, meanwhile, privatised more of the British economy than any other Minister, ever. In so doing, he also completed the destruction of the British coal industry. All in all, and even granting that he opposed the Iraq War, opposed the Poll Tax, and supported the Race Relations Act, it is no wonder that he loves the EU so much, just as it is no wonder that Clarke does. That said, neither they, not Major, nor Ted Heath, would ever have suggested making the entire acquis communautaire the law of this land even though there was to be no further British role in determining its content. Forget the idea that it will be "only up to 2019". That cannot be made to work. The ridiculously misnamed Great Repeal Bill will turn the United Kingdom into a colony of the European Union. With the acquis communautaire as the law of the United Kingdom, several of the good things that the triumph of the Old Tory Left might have made possible, especially the renationalisation of the railways, will remain out of the question. Deviations, if any, will not be by Act of Parliament, but by Ministerial decree. Watch out for who gets to be a Minister with such responsibilities, if at all, from now on. Look up "Finlandization", although this goes well beyond that. And if you are old enough, then consider how you voted in 1983. A reader asks me to revisit an article I wrote some years ago about Alexei Navalny, now being described by many British media as the 'opposition leader' in Russia. As I show, Mr Navalny is not in fact the sort of person with whom the metropolitan liberals who write this stuff would normally associate. Has their loathing of Vladimir Putin blinded them (as their loathing of Bashar al Assad blinded them) to the faults of his opponents? During the attack on the Palace of Westminster last week, the Foreign Office minister Tobias Ellwood displayed both courage and compassion in trying to save the life of the murdered PC Keith Palmer. Largely unknown to the British public until then, Ellwood became a national hero. He was raised instantly to the Privy Council and there is talk of him being given a knighthood. But if democracy means anything, it means retaining our rights and our duty as concerned citizens to pass judgement on Ellwood as a minister. And his performance there has fallen far short of the courage and compassion he showed as a man. For the last two years, Ellwood has been the minister responsible for dealing with Saudi Arabia's war in Yemen. During this period, the Saudis (and their Gulf allies) have inflicted unspeakable carnage. They have bombed weddings, markets, funerals, and a large part of Yemen's architectural heritage. Countless homes have been destroyed. Officially, air strikes now account for some 40,000 human casualties, including 1,900 woman and more than 2,500 children. Many others have died through lack of medical treatment, and increasingly from famine. UNICEF estimates that a child dies every 10 minutes or so in Yemen from hunger or lack of medicine. Throughout this pointless and unnecessary war, Ellwood has been one of the most important apologists for the Saudis - and their campaign of slaughter. He has repeatedly insisted that there is no evidence that Saudi Arabia has broken international humanitarian law. He has helped to block an independent international investigation into alleged Saudi war crimes in Yemen. Ellwood also misled the House of Commons on several occasions last year when he said that the British government had carried out its own assessments of Saudi conduct and concluded that there had no breaches if international humanitarian law. In an excruciating moment in July 2016, Ellwood issued a scrappy statement to Parliament in which he admitted that he had not been telling the truth, and that no such assessments had been carried out. It was issued on the final day before the summer recess and with not a word of apology. Ellwood claims his repeated failure to tell the truth was down to a "mistake". As I have explained here previously, this is an implausible explanation for the Foreign Office failure to be straightforward about the Saudi campaign of carnage in Yemen. It actually maligns the competence of serving officials who cannot defend themselves. Of course, the prime offenders are the Saudi war machine and its murderous allies among the Gulf states. Nevertheless, it would be wrong to absolve Ellwood of all responsibility. This is because Britain is one of the most important allies of Saudi Arabia. We have used our clout as a permanent member of the Security Council to prevent an independent UN investigation and insisted that the Saudis themselves can be relied on to make this assessment - in other words, to mark their own murderous homework. Britain continues to allow our major defence companies to supply arms to Saudi Arabia, along with the US, sending more than $5bn worth since the conflict began. Britain has important strategic interests in the Gulf. Saudi Arabia is one of our closest allies. Thousands of skilled manufacturing jobs in the north of England depend on British aerospace contracts with Saudi Arabia. Our politicians insist that Britain acts as a critical friend, speaking the truth in private to our Saudi allies, while supporting them in public. I believe that Tobias Elwood is at heart a decent man. Perhaps he has indeed confronted the Saudis and sought to persuade them of the error if their ways. If so, his solicitations have had no effect. I visited Yemen last July and saw for myself the damage that the Saudi bombers (backed by the British) have done to this remote and astonishingly beautiful country. Dr Ahmed Yahya al-Haifi, a senior doctor in the Republic Hospital in Sanaa, told me that 25 patients a day in his hospital alone were dying unnecessarily because of a shortfall of medicines. I saw the bridges, deliberately destroyed from the air to stop aid getting through to desperately needy areas. I talked to relatives of those killed in Saudi air strikes. I was moved to hear many people I met speak of their deep affection towards Britain, remembered fondly by older people as a colonial power, and their bewilderment that we were now supporting their Saudi assailants. They told me they supposed our readiness to betray the Yemeni people was because of oil money and the arms trade. I couldn't disagree with them. I am certain that Ellwood knows all of this, and that must trouble him. Politics at a senior level often involves difficult and morally hazardous choices. But the Saudi conduct in Yemen is not morally hazardous. It's morally repugnant. It makes all its defenders collude in war crimes. Ellwood did everything he could to save the life of one policeman horribly murdered in Westminster. But has he done enough to try and save the lives of tens of thousands of Yemenis who have been killed or maimed by the Saudi-led coalition, backed by the British? Four people were killed and approximately 50 injured in the attack last week in London. This was terrible and the British people were rightly appalled and disgusted. However, it is important to reflect that this sort of thing happens all the time in Yemen, and on a much larger scale, and that it is sanctioned by the British. It is hardly ever reported in the British press, and never on a front page, even though it's a British-sponsored war. And the heroism required to save lives in Yemen is close to superhuman because of the Saudi practice of "double tap" air strikes. This is the practice of sending a second strike deliberately to kill the rescuers of victims of a first strike. In the northern Yemeni town of Saada, Amat al-Kareem wept as she told me how she was widowed. Her husband, an ambulance man, had rushed to the scene of a Saudi bombing in order to pull four wounded civilians out of the rubble. They had put them into the back of the ambulance and were setting off for the hospital when the Saudis returned with a second and far more deadly attack. It killed her husband, his colleague, along with the four wounded civilians. In all 26 people died. The UN Security Council respectfully stood for a minute's silence to remember the victims after the London attack last Wednesday. It has never marked any of the victims of the UK-backed Saudi atrocities in Yemen. Never forget there is a connection with the atrocities we support in the Middle East and attacks in Britain. A large part of the British establishment has always been in denial about this. For years, Tony Blair refused to accept that the 7/7 bombings had anything to do with his decision to send British troops to Iraq in 2003. But even before the invasion, MI5 had warned that sending troops to Iraq would jeopardise the lives of British citizens back home. We don't know yet what the long-term consequences of condoning Saudi murder in Yemen will be. Of course, we should never allow our foreign policy to be determined by domestic "blowback" or the fears of terrorism back home, but it is important that we understand that many people across the Middle East no longer believe that Britain is a peace-loving country at all. They don't think we are on the side of decency and tolerance. They think that we are on the side of murder and anarchy. If they are Yemeni, they are right. As Middle East minister, Tobias Ellwood has to sit down with dictators and make deals with torturers. It's a depressing job for any minister with any sense of decency. Like all his predecessors, at least since the end of cheap oil in 1973, the central premise of our Middle Eastern policy has been never to criticise whatever faction of the dynasty of Saud is ruling the country they named after themselves. We have pretended that Saudi Arabia is a loyal ally in the "war against terror". We ignore the fact that Saudi money bankrolled al-Qaeda and probably continues to bankroll its even more murderous successors. The British Foreign Office has made itself dependent on a regime which fundamentally despises Britain. The regime is divided and tottering. We have no idea who will rule the country and its oil if the regime falls – or control the colossal arsenal which we have so eagerly sold it. As Middle East minister, Tobias Ellwood is caught up in the heart of this moral quandary. No minister in any post will ever make all the right judgements. In the Middle East, judgements are harder than almost anywhere else. Ellwood's response to last week's terror attack in Westminster was commendable. He showed that his instincts were in the right place. He displayed physical courage. But there is also something called moral courage. Moral courage involves making a decision which does not bring you into physical danger, but which may jeopardise your career, or cost you in some other way. Has Tobias Ellwood showed moral courage over Yemen? At the end of the day, only he can really answer that. On Monday, I blogged, tweeted and posted that the Durham County Hall phone number to request Nomination Papers did not work. This morning, those Nomination Papers arrived in the post. I have voted for Len McCluskey. As, being eligible, should you. So asked Ted Heath in 1974. The answer was, "Well, not you, Ted. If you have to ask, and all that." But 41 years after his defenestration as Leader of the Conservative Party, his own pre-Cameroon, non-Cameroon, and in some ways even anti-Cameroon Conservative Left, which most people had either forgotten existed or never knew, emerged effortlessly to take back control. It gave itself the positions of Prime Minister, Chancellor of the Exchequer, and Home Secretary, as well as most of the major spending Departments. The Lord Chancellorship was given to a Radical Liberal who had come up through the Lib Dems. And the Foreign Secretaryship was split in three, with each part given to a man who would resign soon enough. David Davis on principle. Liam Fox because of scandal. Boris Johnson by being Boris Johnson. The old position will then be revived, and given to a stalwart of the Very Old New Order. They, as such, had not won the General Election, which might as well never have been held, for all the impact that it now has on the government of this country. They had positively lost the EU referendum, which is to result in the incorporation of the entire acquis communautaire directly into the law of the United Kingdom, with an absolute veto on any "final" deal, both for the implacably pro-Single Market House of Commons, and for the implacably pro-EU House of Lords. This is beyond mere Heathism, as surely as is the requirement of private companies to have trade unions representatives (and who else are they going to be?) on their Boards of Directors. Do not, by the way, get hung up about the return of grammar schools. There will never be a majority for that in either House of Parliament. But speaking of the unions, the pre-Blairite, non-Blairite, and in some ways even anti-Blairite Labour Right has retained a certain amount of clout in some of them, especially Community, USDAW and the GMB, all of which, like Unite, will have much to gain from the scheme to put their reps on the Board. That Right has also maintained a very strong base in local government. Yet for 20 years, between the death of John Smith and the election of Tom Watson, it held neither of its party's top positions. It was therefore as dispossessed as the Left was, and it is therefore now as determined as the Left is to keep its man in post. Bear in mind that the votes that elected them both must have been cast in very large part by the same people. Meanwhile, the General Election-winning Cameroons, in the person of their principal strategist, are about to assume the Editorship of the Evening Standard. Look out for further inroads into the media. The Editor of The Times is 65. The Editor of the Daily Mail is 68. It is possible that George Osborne intends to be the Mayor of London and the Editor of the Evening Standard simultaneously. It is certain that Ruth Davidson intends to be First Minister of Scotland. Her party has more seats in the current Scottish Parliament than the SNP had in the first one. All in all, the shape is becoming clear. Politics itself is for the Labour Left and everyone who comes with it, for the traditional Labour Right, and for the traditional Conservative Left. Commentary is for the globalist, socially ultra-liberal, pro-EU, internationally interventionist, and mostly very posh wing of the Conservative Party. With a few of their Blairite mates let in as a favour. But Blairism in general is now peculiar to hobbyists, dilettantes and cranks. As is the Conservative Right. And as is however many UKIPs there are in any given week. Of course, there will always be the Daily Telegraph. But unless it adapts to the New Order, then it can expect a circulation comparable to that of the Morning Star, and vastly less influence than the only newspaper that is permitted in the office of the Leader of the Opposition, the only newspaper for which MPs write several times per week, the newspaper on which their Leader has a column. For that last reason, especially, no one seriously doubts that, like Margaret Thatcher during the Miners' Strike, Theresa May reads the Morning Star every day. But for how much longer will either she or Jeremy Corbyn read the Telegraph? Do they, even now? The British Ambassador turned up to hand in the Article 50 letter at lunchtime? In a French-speaking city? You see, this is why we are leaving, and this is why they are glad to see the back of us. Oh, well, the Great Repeal Bill turns out to mean the exact opposite of that which its name would suggest, being instead the incorporation of the entire acquis communautaire directly into the law of this land. That can only work by including all future additions and alterations, in which no British institution will have any say whatever. Yet every such addition and alteration will automatically become the law here. And the promise of an absolute veto on the "final" deal for each House of Parliament was repeated again to one of them by the Prime Minister this afternoon. This side of a Corbynite Labour landslide, there is no conceivable majority in the Commons for withdrawal from the Single Market. In the Lords, there never, ever will be, nor even for withdrawal from the EU itself. As Tony Benn tried to tell you, 45 years ago. In accordance with which, you had the opportunity to vote, 34 years ago. And so, Donald Trump's infrastructure programme begins to meet with Democratic approval. The Republican Party, to which he has barely any connection and of which he has no need, is simply irrelevant these days. In that, it is like UKIP (or however many UKIPs there now are), and it is like the right wings of the Conservative, Labour and Liberal Democrat parties in this country. Or, at any rate, the Blairite Right of the Labour Party. The more traditional kind, which held neither of the top positions for 20 years after the death of John Smith, does not hold the Deputy Leadership. In similar fashion, the non-traditional Left of the Conservative Party, rather than the practically archaeological one that now provides three of the four holders of what used to be called the Great Offices of State, is about to assume the Editorship of the Evening Standard, with further such appointments doubtless to follow soon. After all, it did win a General Election outright a mere two years ago. The media, and especially the print media, have been the Right's perennial powerbase. It has been impossible to imagine a commentator remotely as Far Left as many were routinely Far Right. If the Right is losing even the papers, then it really is over. Put together the Brexit demands of Open Britain and those of Keir Starmer, and you have the deal that Theresa May intends to put to the electorate in a referendum in 2019. The other option will be that of simply remaining in the EU as if nothing had happened. Who says that you can't do that after Article 50? Definitely not Article 50's (British) author. May was given the job unopposed precisely because she was a Remainer, and she is surrounded by them. Consider that, while the Shadow Chancellor and the Shadow Lord Chancellor probably voted Leave, and certainly gave no support whatever to the Remain campaign, the Chancellor is a firm Remainer, while the Lord Chancellor is a fanatical one. There were proportionally more pro-Leave MPs among the supporters of Jeremy Corbyn's Leadership bid than there were among the supporters of Theresa May's. No one in May's office or entourage, and almost no one in her party, has anything remotely approaching the root and branch hostility to the EU that characterises Seumas Milne, or Andrew Fisher, or Max Shanly, or Tariq Ali, or Andrew Murray, or Lindsey German, or John Rees, or Chris Nineham, to name but a few. Just as only they, who have vigorously opposed the last three Presidents of the United States and who would have done the same to Hillary Clinton, can credibly lead the opposition to Donald Trump, so only they can credibly argue for a coherent vision of a Britain wholly outside the EU. Seumas Milne and Andrew Fisher, Max Shanly and Tariq Ali, Andrew Murray and Lindsey German, John Rees and Chris Nineham, Liam Young and Alex Nunns, Dennis Skinner and Ronnie Campbell, Kelvin Hopkins and George Galloway, John McDonnell and Richard Burgon. And, of course, Jeremy Corbyn. Prescription charges in England ought to be abolished, with the cost met by cutting the block grant to the devolved body in Scotland, which has fiscal powers of its own. And the Parliament of the United Kingdom ought to legislate for a Scottish independence referendum this year, whether or not that was when Nicola Sturgeon happened to want it. Among other things, it is time to make the supermarkets invest in agriculture and small business by means of a windfall tax. Investment to be determined in close consultation with the National Farmers’ Union and the Federation of Small Businesses. A windfall tax to be followed, if necessary, by a permanently higher flat rate of corporation tax. With, in either case, strict regulation to ensure that the costs of this are not passed on to suppliers, workers, consumers, communities or the environment. How much longer can Turkey be allowed to stay in NATO? If this alliance really does exist to defend freedom, how can it tolerate a member whose government has flung so many journalists into prison without any sort of due process? Turkey's leader Recep Tayyip Erdogan is fast turning into a tyrant, dangerous at home and abroad. I am amazed at how little we seem to care. Whatever our opinion of British withdrawal from the EU, it will necessitate an enormous investment in production in the United Kingdom by the Volkswagen Group (including Audi, SEAT, Škoda and several other marques). We intend to bring Volkswagen to County Durham. To that end, in view of the closure of the DLI Museum, in view of the amassing of vast reserves while services have been and are being cut, in view of the bailing out of Durham County Cricket Club despite those cuts, in view of the mismanagement of relations with the Regional Assembly, in view of the selling off of care homes at discounted value, in view of the scandal of Windlestone Hall, in view of the enormous compensation awarded to a teacher and the substantial additional cost of the failure to pay it promptly, in view of the lavish expense of entertainment by senior Councillors and Officers, and in view of the appalling abuse of the Teaching Assistants, we welcome, endorse, echo and reiterate the call for the election of no Labour candidate whatever to Durham County Council on 4th May. We further welcome, endorse, echo and reiterate the call for a Cabinet position for every non-Labour Group and for those of no Group, with the numbers made up based on their relative size. For the same for scrutiny chairs, obviously never mirroring the portfolios of their respective partisans. And for representation on each committee and subcommittee in proportion to their numbers on the authority as a whole. I am the author of Operation Israel: The Rearming of Argentina During the Dictatorship 1976-1983. That is the original and definitive account of Israel’s arming of Argentina during the war with Britain in 1982. From his base in Lanchester, County Durham, the writer and activist David Lindsay is arranging for the forthcoming second edition to be translated into English and published in the United Kingdom, with a preface or foreword by a distinguished British political figure. All of this is undoubtedly known to several Israeli and other intelligence agencies. On Tuesday 14th March, Mr Lindsay was arrested at his home and held all day before being questioned by the Police in relation to an incident to which he had no connection, namely the sending of a threatening letter to members of Durham County Council. He was not held overnight, and he was released unconditionally and without charge. Those responsible know who they are. Let them be in no doubt: Operation Israel will be translated into English, and it will be published in the United Kingdom, thanks to David Lindsay. On Tuesday 14th March, despite having been given no opportunity to accompany the Police voluntarily, the Lanchester-based writer and activist, David Lindsay, was arrested on the “grounds” of supposed similarities between his letter published in the Northern Echo on Friday 10th March, and a threatening letter allegedly sent to Labour members of Durham County Council. When questioned by the Police, he comprehensively refuted the suggestion of any such similarity. He was released without charge and on unconditional bail. This shameful and shameless political hit job recalls the darkest days of Northern Ireland, with no dividing line between the Police, a massively dominant local political party, and a secret society bound by oaths. It is impossible to rule out an anti-Catholic aspect to this case, and impossible to ignore the fact that David Lindsay is mixed-race. Other than the Teaching Assistants themselves, David Lindsay is their preeminent supporter. He secured the endorsement of their cause by several national trade union leaders in the Northern Echo on 3rd August 2016. He secured their landmark meeting with Jeremy Corbyn on the eve of last year’s Miners’ Gala. And he secured the support that George Galloway expresses for them regularly on his radio programme, and routinely to his quarter of a million followers on Twitter, as well as at least once (23rd November 2016) in a letter to the Northern Echo. David Lindsay is also a powerful critic of the closure of the DLI Museum, of the amassing of vast reserves while services have been and are being cut, of the bailing out of Durham County Cricket Club despite those cuts, of the mismanagement of relations with the Regional Assembly, of the selling off of care homes at discounted value, of the scandal of Windlestone Hall, of the circumstances that necessitated the award of enormous compensation to a teacher, of the substantial additional cost of the failure to pay that compensation promptly, and of the lavish expense of entertainment by senior Councillors and Officers. And David Lindsay is the originator of the proposal that unites the trade unions with Conservatives, Liberal Democrats and Independents, to bring the whole of the Volkswagen Corporation’s production for the British market to County Durham after Brexit. David Lindsay is the natural and obvious Leader of Durham County Council. We look forward to that happy day. Racist, sectarian and partisan hit jobs must not be permitted to prevent it. As a member of Unite, I am honoured and delighted to join pillars of our Movement such as Ken Loach, Harry Leslie Smith, the Durham Miners’ Association, the Blacklist Support Group, and the Morning Star, in endorsing Brother Len McCluskey against the challenges of the opportunist Right and the sectarian ultra-Left. Whatever good they may have done within and through our union, Gerard Coyne is seeking to damage Jeremy Corbyn (even stooping to a line on immigration that is the exact opposite of his Blairite backers’ up to now), while Ian Allinson is trying to establish his groupuscule as a presence on the public stage. Neither of those purposes is among the proper aims of Unite, aims towards which Len has been working tirelessly, and with considerable success, for nearly 50 years. As the Notice of Poll goes out, beware of decoy candidates fielded by County Durham Labour Party, the embarrassing relative that the national Labour Party pretends does not exist. The fielding of decoy candidates is one of its several dirty tricks. Others include the award of irregular contracts, the issuing of a mere caution to a Council Officer who gazumped land fees, the letting off of Councillors who failed to pay Council Tax, the failure of Councillors to declare interests, the promotion of their own businesses, the refusal to respond to Freedom of Information Requests, and the refusal to provide information to non-Labour candidates. Indeed, the telephone number listed on the Council's website for requesting nomination papers does not in fact exist. It is easy to laugh at the waste of five thousand pounds on a bus shelter that was not on a bus route, and that kind of thing. But the overall picture is very nasty indeed. Such are Jeremy Corbyn's Labour enemies when they are in power. If the Indian State of Uttar Pradesh were a country, then it would be the fifth most populous in the world. Its 200 million inhabitants are now governed by Yogi Adityanath, who makes his Party Leader, Narendra Modi, look like Tim Farron. The Commonwealth is a cultural thing, essentially a social club. It is good and useful as that, but it is nothing more than that, it never will be, and it arguably never has been. Regardless of any previous tie to Britain, all of the rising powers of Asia ought to be treated in exactly the same way. The fact that Jeremy Corbyn is the Leader of the Labour Party and the Leader of the Opposition is the reason why Theresa May is even talking about workers’ and consumers’ representation in corporate governance, shareholders’ control over executive pay, restrictions on pay differentials within companies, an investment-based Industrial Strategy and infrastructure programme, greatly increased housebuilding, action against tax avoidance, a ban on public contracts for tax-avoiding companies, a cap on energy prices, banning or greatly restricting foreign takeovers, and banning unpaid internships. Two years ago, the only politicians advocating all but one of those were Corbyn and John McDonnell, while the energy price cap, proposed by Ed Miliband, was being screamed down by the people whom Nick Cohen wishes were now running the Labour Party. Corbyn has won two Leadership Elections as the only candidate to the left of May, opposing the austerity programme while having also opposed every British military intervention of the last 20 years, that period’s privatisation of the NHS and other public services, its persecution of the disabled, its assaults on civil liberties, its prostration to Saudi Arabia, and its demonisation of Russia. All of those have happened continuously since 1997, under the Conservatives, the Liberal Democrats and New Labour alike. The rise of populism has rattled the global political establishment. Brexit came as a shock, as did the victory of Donald Trump. Much head-scratching has resulted as leaders seek to work out why large chunks of their electorates are so cross. The answer seems pretty simple. Populism is the result of economic failure. The 10 years since the financial crisis have shown that the system of economic governance which has held sway for the past four decades is broken. Some call this approach neoliberalism. Perhaps a better description would be unpopulism. Unpopulism meant tilting the balance of power in the workplace in favour of management and treating people like wage slaves. Unpopulism was rigged to ensure that the fruits of growth went to the few not to the many. Unpopulism decreed that those responsible for the global financial crisis got away with it while those who were innocent bore the brunt of austerity. Anybody seeking to understand why Trump won the US presidential election should take a look at what has been happening to the division of the economic spoils. The share of national income that went to the bottom 90% of the population held steady at around 66% from 1950 to 1980. It then began a steep decline, falling to just over 50% when the financial crisis broke in 2007. Similarly, it is no longer the case that everybody benefits when the US economy is doing well. During the business cycle upswing between 1961 and 1969, the bottom 90% of Americans took 67% of the income gains. During the Reagan expansion two decades later they took 20%. During the Greenspan housing bubble of 2001 to 2007, they got just two cents in every extra dollar of national income generated while the richest 10% took the rest. The US economist Thomas Palley (Who Runs the Economy?, Palgrave Macmillan, edited by Robert Skidelsky and Nan Craig) says that up until the late 1970s countries operated a virtuous circle growth model in which wages were the engine of demand growth. “Productivity growth drove wage growth which fueled demand growth. That promoted full employment, which provided the incentive to invest, which drove further productivity growth,” he says. Unpopulism was touted as the antidote to the supposedly failed policies of the postwar era. It promised higher growth rates, higher investment rates, higher productivity rates and a trickle down of income from rich to poor. It has delivered none of these things. James Montier and Philip Pilkington, of the global investment firm GMO, say that the system which arose in the 1970s was characterised by four significant economic policies: the abandonment of full employment and its replacement with inflation targeting; an increase in the globalisation of the flows of people, capital and trade; a focus on shareholder maximisation rather than reinvestment and growth; and the pursuit of flexible labour markets and the disruption of trade unions and workers’ organisations. To take just the last of these four pillars, the idea was that trade unions and minimum wages were impediments to an efficient labour market. Collective bargaining and statutory pay floors would result in workers being paid more than the market rate, with the result that unemployment would inevitably rise. Unpopulism decreed that the real value of the US minimum wage should be eroded. But unemployment is higher than it was when the minimum wage was worth more. Nor is there any correlation between trade union membership and unemployment. If anything, international comparisons suggest that those countries with higher trade union density have lower jobless rates. The countries that have higher minimum wages do not have higher unemployment rates. “Labour market flexibility may sound appealing, but it is based on a theory that runs completely counter to all the evidence we have,” Montier and Pilkington note. This quest for ever-greater labour market flexibility has had some unexpected consequences. The bill in the UK for tax credits spiralled quickly once firms realised they could pay poverty wages and let the state pick up the bill. Access to a global pool of low-cost labour meant there was less of an incentive to invest in productivity-enhancing equipment. The abysmally low levels of productivity growth since the crisis have encouraged the belief that this is a recent phenomenon, but as Andy Haldane, the Bank of England’s chief economist, noted last week, the trend started in most advanced countries in the 1970s. “Certainly, the productivity puzzle is not something which has emerged since the global financial crisis, though it seems to have amplified pre-existing trends,” Haldane said. Bolshie trade unions certainly can’t be blamed for Britain’s lost productivity decade. The orthodox view in the 1970s was that attempts to make the UK more efficient were being thwarted by shop stewards who modeled themselves on Fred Kite, the character played by Peter Sellers in I’m All Right Jack. Haldane puts the blame elsewhere: on poor management, which has left the UK with a big gap between frontier firms and a long tail of laggards. “Firms which export have systematically higher levels of productivity than domestically oriented firms, on average by around a third. Populism is seen as irrational and reprehensible. It is neither. It seems entirely rational for the bottom 90% of the US population to question why they are getting only 2% of income gains. It hardly seems strange that workers in Britain should complain at the weakest decade for real wage growth since the Napoleonic wars. It has also become clear that ultra-low interest rates and quantitative easing are merely sticking-plaster solutions. Populism stems from a sense that the economic system is not working, which it clearly isn’t. In any other walk of life, a failed experiment results in change. Drugs that are supposed to provide miracle cures but are proved not to work are quickly abandoned. Businesses that insist on continuing to produce goods that consumers don’t like go bust. That’s how progress happens. The good news is that the casting around for new ideas has begun. Trump has advocated protectionism. Theresa May is consulting on an industrial strategy. Montier and Pilkington suggest a commitment to full employment, job guarantees, reindustrialisation and a stronger role for trade unions. The bad news is that time is running short. More and more people are noticing that the emperor has no clothes. Even if the polls are right this time and Marine Le Pen fails to win the French presidency, a full-scale political revolt is only another deep recession away. And that’s easy enough to envisage. Here's a fun fact from the Durham Teaching Assistants' Solidarity March and Rally. Such is the distribution of the TAs by ward, and so small (contrary to what is often assumed) are so many of the Labour majorities these days, that if each TA and four others voted against Labour, then Labour would lose over 50 seats. Frankly, we can deliver those votes in far larger numbers than that. We can. We must. And we will. "But UKIP got four million votes!" And how very, very, very long ago that seems now. There is no electoral space to the right of wherever the Conservative Party happens to be at the given time. That space simply does not exist. Ask Nigel Farage and Paul Nuttall, with 12 failed attempts between them to enter the House of Commons. Consider, by contrast, that George Galloway's return to Parliament at Manchester Gorton would restore the situation that obtained between 2012 and 2015. That was when members of the House of Commons from outside the Labour Party and to the left of most of its MPs were taking their seats on behalf of all five of Scotland, Wales, Northern Ireland, the South of England, and the North of England. As of today, UKIP is a party with no MPs. There are scores of those, and they should all demand as much coverage as UKIP is given, especially by the BBC. Paul Nuttall is to be on Question Time again this week. Why? Over a thousand at the Durham Teaching Assistants' Solidarity March and Rally. A promise from Ken Loach to attend the showing of I, Daniel Blake on 27th April. And a message of "unconditional support for your inspirational campaign" from John McDonnell. That raises the serious question of the precise sense in which the Labour Group on Durham County Council still purports to be anything to do with the Labour Party. So, Obamacare is to last forever, then. Thanks to the insistence of the Republican Party. November now seems like a very long time ago. Jeremy Corbyn's Labour fielded eight candidates in the City of London, where Labour acquired its first ever seat a mere three years ago. Last night, five of those eight were elected. Jeremy Corbyn's Labour enemies intend to field 126 candidates for Durham County Council, which Labour has controlled for more than 100 years. There is no reason why any of those 126 ought to be elected. The University computers are as slow as ever, and they still don't have spellcheck on the Internet. There is something reassuring about those two facts, isn't there? My main point, however, is that an unbelievably posh student (even by Durham's standards) is braying at huge volume that he has been taken to Caffè Nero and interviewed about becoming a Labour member of Durham County Council. Thomas Mair, the murderer of Jo Cox, described himself to the Police as “a political activist”, and so he was. No Irish Republican organisation has murdered a Member of Parliament in the present century or in the preceding decade, and the people responsible are now such pillars of the British Establishment that they are entertained at Windsor Castle. No Islamist or Leftist organisation has ever murdered a Member of Parliament. But the Far Right has done so, only last year. Although a “strong supporter” of Israel did attempt to murder George Galloway while he was the MP for Bradford West. These days, though, that constitutes part of the Far Right. Give that a moment to sink in. National Fronts come and BNPs go, EDLs come and Britain Firsts go, but certain institutional and organisational manifestations of the Far Right are perennial, hitherto even permanent. Mair’s is the Springbok Club, which is run by the people who also run the London Swinton Circle. And that, in turn, was addressed by Liam Fox (born 1961) and by Owen Paterson (born 1956) as recently as 2014. In the Thatcher and, to a lesser extent, Major years, there were Ministers who were members of the Western Goals Institute or the Monday Club. Those crossed over, via such things as the League of Saint George, to overt neo-Nazism on the Continent, to the Ku Klux Klan, to apartheid South Africa, to Ian Smith’s Rhodesia, to the juntas of Latin America, to Marcos and Suharto, to the Duvaliers, and so on. The days of treating even support for the NHS as Loony Leftism, while maintaining no right flank whatever on the officially designated political mainstream, are well and truly over. The dominoes have already started to fall. Some highly prominent people in what thinks that it is now this country’s perpetual party of government need to be very, very, very afraid. But no part of the Far Right, including fanatical support for Israel, is ever treated as a security risk. Just as you can never be too young to be taken entirely seriously as a right-wing commentator. Not long ago, the Telegraph and the Spectator were simultaneously carrying someone who was still at school. And just as there is no view so right-wing that it would preclude, say, a Times column, or a regular gig on The Moral Maze. “White Western nationalism” was extolled repeatedly by Melanie Phillips a few weeks ago, days after she had written that there were no such nations as the Scots and the Irish. Try and imagine a public figure remotely as Far Left as that is Far Right. You can’t. It couldn’t happen. Parliament attacked using a hire car and a kitchen knife. The state pension age to go up to 70. Aren't you glad that we kept Trident? Not least by means of the hashtag #GG4Gorton, through which the posters that are already up may be viewed, George Galloway's by-election campaign is in full swing at Manchester Gorton, using the same means that succeeded at Bradford West, and using much the same pitch, too. The Labour shortlist has again been designed to placate the various factions of the Pakistani braderi system, which is in fact the carrying over of ancestral caste into Indo-Islam. Caste itself also persists even among Sikhs, founded though they were in a rejection of it, and among people whose families have been Christian for many generations, even centuries. Braderi, however, just does not interest second or third generation Mancunians whose first language is English and who easily pass any cricket test (but who are far more interested in football), as it just did not interest second or third generation Bradfordians whose first language was English and who easily passed any cricket test (but who were far more interested in football). Moreover, the concentration on it alienates everyone else. In 2012, Galloway topped the poll in every ward of Bradford West, including those which were more than 90 per cent white. The seat itself had been a Conservative target only two years before. The election of Galloway at Manchester Gorton is as important as the re-election of Len McCluskey as General Secretary of Unite, and it is as important as the removal of Labour from Durham County Council, a removal on which depend many thousands of new jobs that would simply never occur to the know-nothing, do-nothing, right-wing-if-anything Labour Establishment here. As much as anything else, Galloway's return to Parliament would restore the situation that obtained between 2012 and 2015, when members of the House of Commons from outside the Labour Party and to the left of most of its MPs were taking their seats on behalf of all five of Scotland, Wales, Northern Ireland, the South of England, and the North of England. Meanwhile, at least one of my slogans for the 2020 General Election is already "Tony Blair Didn't Dare", and I intend to put out a leaflet under that title which would detail the entire case against him, stating the fact that that was why had not had the courage or the gall to seek this open seat right here in his old County Durham stomping ground. As to who was the Labour candidate, is there even going to be one worthy of the name? The new boundaries suggest a Constituency Labour Party even more of the local know-nothing, do-nothing, right-wing-if-anything Labour Establishment than North West Durham was in the dark days of Hilary Armstrong. With no chance of getting lucky a second time, and finding another Pat Glass figure whom they had not realised was there, the all-women shortlist will mean that they really were looking at some girl out of the typing pool, and almost certainly the London typing pool at that. Beating her would be so easy that it would seem almost cruel. But politics is a rough old trade. In itself, this can be seen as the taking of three minutes to say nothing. Nevertheless, “I can today announce that we are now extremely close to confirming new grading proposals which will mark a sea change from where we were previously. We shall, Simon. We shall, indeed. It is the Teaching Assistants themselves who have fought so very, very hard for this. The rest of us have been the ancillaries here, and proud to be so. I, for example, secured the endorsement of their cause by several national trade union leaders in the Northern Echo on 3rd August 2016. I secured their landmark meeting with Jeremy Corbyn on the eve of last year’s Miners’ Gala. And I secured the support that George Galloway expresses for them regularly on his radio programme, and routinely to his quarter of a million followers on Twitter, as well as at least once in a letter to the Northern Echo. All credit, though, is the TAs’ own. I could not have been more privileged to have played even so small a part in their justly legendary campaign. 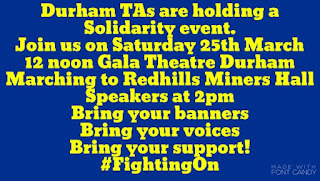 As we approach the County Council election on 4th May, we must all continue to provide powerful criticism of the treatment of the Teaching Assistants, of the closure of the DLI Museum, of the amassing of vast reserves while services have been and are being cut, of the bailing out of Durham County Cricket Club despite those cuts, of the mismanagement of relations with the Regional Assembly, of the selling off of care homes at discounted value, of the scandal of Windlestone Hall, of the circumstances that necessitated the award of enormous compensation to a teacher, of the substantial additional cost of the failure to pay that compensation promptly, and of the lavish expense of entertainment by senior Councillors and Officers. Some of us are also working on an enormous proposal that will unite the trade unions with the Conservatives, Liberal Democrats and Independents in very stark contrast to the last third of a century, during which, even while the then Labour MP for Sedgefield was the Prime Minister for 10 years, Labour in County Durham has merely managed the poverty that its own leading figures have so conspicuously evaded. Everything now hinges on who will be the new Leader of Durham County Council. At 11 o’clock this morning, Tuesday 21st March 2017, listeners to Radio Four were treated to the latest of Tony Blair’s increasingly frequent political interventions, this time bewailing the disarray of the political “centrism” that is in fact nothing more than his own collection of opinions. In 2020, I shall be contesting the new seat of Durham West and Teesdale, most of which is where Pat Glass MP will be retiring. I shall be doing so without any party designation, not even the word “Independent”. I am not a member of any political party, but I am part of numerous partially overlapping networks of political interdependence locally, nationally and internationally. Since he has taken to reasserting himself in British politics, I challenge Tony Blair to declare that he is the Labour candidate for this open seat here in his old County Durham stomping ground. Either that, or to shut up and go away. As the proprietor of the whole of Sky, Rupert Murdoch might do some good. We represent positions that the BBC simply ignores. The workers, and not the liberal bourgeoisie, as the key swing voters. Identity issues located within the struggle for economic equality and for international peace. The leading role in the defence of universal public services of those who would otherwise lack basic amenities, and in the promotion of peace of those who would be the first to be called upon to die in wars. The decision of the EU referendum by areas that vote Labour, Liberal Democrat or Plaid Cymru. We respectfully request that Mr Murdoch identify and include representatives of the traditions in which we stand. "Owen Jones Quits Social Media"
Has Heseltine Really Been Sacked? "Some of Them Could Be Grammar Schools"